Remember when colorblock was all the rage? Well I'm not quite finished with this trend yet. I love the variety of color, mixing of stripes, pleats, and other details. 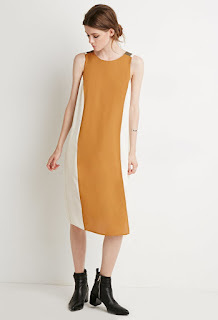 Today we are throwin' it back on Thursday for some great colorblock dresses. 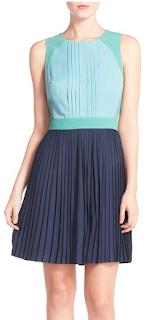 Mint, navy, and pleats. What else do you need this summer? Do not wait on this beauty. It's perfect for summer evening parties, weddings, you name it. Simple, elegant, and just effortless. I like a trapeze dress for summer because it's loose but its more fitted than a shift dress. Colorblock isn't quite vintage yet but where did it go? I'm bringing it back for summer because it's bright, colorful, and perky.